The T4 program was a program devised to commit the most vile of crimes ever committed in history. Initially it was ‘sold’ under the motto of mercy killings for the ‘incurably ill’ , several rationales for the program had been offered, including eugenics, compassion, reducing suffering, racial hygiene, cost effectiveness and pressure on the welfare budget. But it quickly turned into the killing of the disabled. Just a note before I continue and I don’t mean this to be a political blog but the fact hasn’t escaped me that some of these rationales are currently used in several euthanasia and abortion legislation across the western world. Adolf Hitler initiated this program in 1939, and, while it was officially discontinued in 1941, killings continued covertly until the military defeat of Nazi Germany in 1945. Within a few months, the T4 Program—named for the Chancellery offices that directed it from the Berlin address Tiergartenstrasse 4—involved virtually the entire German psychiatric community. The program’s directors ordered a survey of all psychiatric institutions, hospitals, and homes for chronically ill patients. At Tiergartenstrasse 4, medical experts reviewed forms sent by institutions throughout Germany but did not examine patients or read their medical records. Nevertheless, they had the power to decide life or death. While the program’s personnel killed people at first by starvation and lethal injection, they later chose asphyxiation by poison gas as the preferred killing technique. Physicians oversaw gassings in chambers disguised as showers, using lethal gas provided by chemists. Program administrators established gas chambers at six killing centres in Germany and Austria: Hartheim, Sonnenstein, Grafeneck, Bernburg, Hadamar, and Brandenburg. The SS staff in charge of the transports donned white coats to keep up the charade of a medical procedure. Program staff informed victims’ families of the transfer to the killing centres. Visits, however, were not possible. The relatives then received condolence letters, falsified death certificates signed by physicians, and urns containing ashes. In mid-1939 Hitler authorized the creation of the Reich Committee for the Scientific Registering of Serious Hereditary and Congenital Illnesses (Reichsausschuss zur wissenschaftlichen Erfassung erb- und anlagebedingter schwerer Leiden), headed by Dr. Karl Brandt, his personal physician, and administered by Herbert Linden of the Interior Ministry as well as SS-Oberführer Viktor Brack. Brandt and Bouhler were authorized to approve applications to kill children in relevant circumstances, though Bouhler left the details to subordinates such as Brack and SA-Oberführer Werner Blankenburg. Extermination centres were established at six existing psychiatric hospitals: Bernburg, Brandenburg, Grafeneck, Hadamar, Hartheim, and Sonnenstein. They played a crucial role in developments leading to the Holocaust.As a related aspect of the “medical” and scientific basis of this programme, the Nazi doctors took thousands of brains from ‘euthanasia’ victims for research. From August 1939 the Interior Ministry began registering children with disabilities, requiring doctors and midwives to report all cases of newborns with severe disabilities; the ‘guardian’ consent element soon disappeared. Those to be killed were identified as “all children under three years of age in whom any of the following ‘serious hereditary diseases’ were ‘suspected’: idiocy and Down syndrome (especially when associated with blindness and deafness); microcephaly; hydrocephaly; malformations of all kinds, especially of limbs, head, and spinal column; and paralysis, including spastic conditions”.The reports were assessed by a panel of medical experts, of whom three were required to give their approval before a child could be killed. The Ministry used various deceptions when dealing with parents or guardians particularly in Catholic areas, where parents were generally uncooperative. Parents were told that their children were being sent to “Special Sections” for children, where they would receive improved treatment. The children sent to these centres were kept for “assessment” for a few weeks and then killed by injection of toxic chemicals, typically phenol; their deaths were recorded as “pneumonia”. Autopsies were usually performed, and brain samples were taken to be used for “medical research”. This apparently helped to ease the consciences of many of those involved, since it gave them the feeling that the children had not died in vain, and that the whole programme had a genuine medical purpose. “various borderline or limited impairments in children of different ages, culminating in the killing of those designated as juvenile delinquents. Jewish children could be placed in the net primarily because they were Jewish; and at one of the institutions, a special department was set up for ‘minor Jewish-Aryan half-breeds'”. At the same time, increased pressure was placed on parents to agree to their children being sent away. Many parents suspected what was really happening, especially when it became apparent that institutions for children with disabilities were being systematically cleared of their charges, and refused consent. The parents were warned that they could lose custody of all their children, and if that did not suffice, the parents could be threatened with call-up for ‘labour duty’. By 1941 more than 5,000 children had been killed.The last child to be killed under Action T4 was Richard Jenne on 29 May 1945 in the children’s ward of the Kaufbeuren-Irsee state hospital in Bavaria, Germany, more than three weeks after troops from the U.S. had occupied the town. The first adults with disabilities to be killed on a mass scale by the Nazi regime were not Germans, but Poles. They were shot by the SS men of Einsatzkommando 16, Selbstschutz and EK-Einmann under direct command of SS-Sturmbannführer Rudolf Tröger, with overall command by Reinhard Heydrich during the genocidal Operation Tannenberg in which 36,000–42,000 people including Polish children died before the end of 1939 in Pomerania. All hospitals and mental asylums of the Wartheland were emptied. The region was incorporated into Germany and earmarked for resettlement by Volksdeutsche following the German conquest of Poland. Notably, the technology for mass gassing of hospital patients had not been invented yet. In the Danzig (now Gdańsk) area, some 7,000 Polish patients of various institutions were shot, while 10,000 were killed in the Gdynia area. Similar measures were taken in other areas of Poland destined for incorporation into Germany.The first experiments with the gassing of patients were conducted in October 1939 at Fort VII in Posen (occupied Poznań), where hundreds of prisoners were killed by means of carbon monoxide poisoning in an improvised gas chamber developed by Dr Albert Widmann, chief chemist of the German Criminal Police (Kripo). The idea of killing adult mental patients soon spread from occupied Poland to adjoining areas of Germany, probably because Nazi Party and SS officers in these areas were most familiar with what was happening in Poland. These were also the areas where Germans wounded from the Polish campaign were expected to be accommodated, which created a demand for hospital space. The Gauleiter of Pomerania, Franz Schwede-Coburg, sent 1,400 patients from five Pomeranian hospitals to undisclosed locations in occupied Poland where they were shot. Likewise, the Gauleiter of East Prussia, Erich Koch, had 1,600 patients murdered out of sight. In all, more than 8,000 Germans were killed in this initial wave of killings carried out under the command of local officials, although Himmler certainly knew and approved of them. The sole legal basis for the programme was a 1939 letter from Hitler, not a formal ‘Führer’s decree’ which would carry the force of law. Hitler deliberately bypassed Health Minister Conti and his department, who might have raised questions about the legality of the programme. He entrusted it to his personal agents Bouhler and Brandt. The programme was administered by Viktor Brack. and his staff from Tiergartenstraße 4 disguised as the “Charitable Foundation for Cure and Institutional Care” offices which served as the front. It was supervised by Bouhler and Brandt. and August Becker, an SS chemist. In early October all hospitals, nursing homes, old-age homes and sanatoria were required to report all patients who had been institutionalised for five years or more, who had been committed as “criminally insane”, who were of “non-Aryan race”, or who had been diagnosed with any of a list of specified conditions. These included schizophrenia, epilepsy, Huntington’s chorea, advanced syphilis, senile dementia, paralysis, encephalitis and “terminal neurological conditions generally”. Many doctors and administrators assumed that the purpose of the reports was to identify inmates who were capable of being drafted for “labour service”. They tended to overstate the degree of incapacity of their patients, to protect them from labour conscription – with fatal consequences.When some institutions refused to co-operate, teams of T4 doctors (or in some cases Nazi medical students) visited them and compiled their own lists, sometimes in a very haphazard and ideologically motivated way.At the same time, during 1940 all Jewish patients were removed from institutions and killed. As with the child inmates, the adult cases were assessed by a panel of experts, working at the Tiergartenstraße offices. The experts were required to make their judgments solely on the basis of the reports, rather than on detailed medical histories, let alone examinations. Sometimes they dealt with hundreds of reports at a time. On each they marked a + (meaning death), a – (meaning life), or occasionally a ? meaning that they were unable to decide. Three “death” verdicts condemned the person concerned. As with reviews of children, over time these processes became less rigorous, the range of conditions considered “unsustainable” grew broader, and zealous Nazis further down the chain of command increasingly made decisions on their own initiative.Picture below is of Hartheim Euthanasia Centre where more then 18,000 patients were killed. The first gassings in Germany proper took place in January 1940 at the Brandenburg Euthanasia Centre. The operation was headed by Viktor Brack, who said: “the needle belongs in the hand of the doctor.”Bottled pure carbon monoxide gas was used.At trials, Brandt described the process as a “major advance in medical history” Once the efficacy of the method was confirmed, it became standardised, and instituted at a number of centres across Germany under the supervision of Widmann, Becker, and Christian Wirth – a Kripo officer who later played a prominent role in the extermination of the Jews as commandant of newly built death camps in occupied Poland. In addition to Brandenburg, the killing centres included Grafeneck Castle in Baden-Württemberg (10,824 dead), Schloss Hartheim near Linz in Austria (over 18,000 dead), Sonnenstein Euthanasia Centre in Saxony (15,000 dead), Bernburg Euthanasia Centre in Saxony-Anhalt and Hadamar Euthanasia Centre in Hesse (14,494 dead). The same facilities were also used to kill mentally sound prisoners transferred from concentration camps in Germany, Austria and occupied parts of Poland. 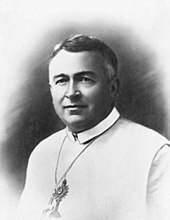 Bishop Jan Maria Michał Kowalski killed at Hartheim Euthanasia Centre. Condemned patients were ‘transferred’ from their institutions to newly built centres in the T4 Charitable Ambulance buses, called the Community Patients Transports Service. They were run by teams of SS men wearing white coats, to give it an air of medical care. To prevent the families and doctors of the patients from tracing them, the patients were often first sent to transit centres in major hospitals, where they were supposedly assessed. They were moved again to “special treatment” (Sonderbehandlung) centres. Families were sent letters explaining that owing to wartime regulations, it was not possible for them to visit relatives in these centres. Most of these patients were killed within 24 hours of arriving at the centres, and their bodies cremated.For every person killed, a death certificate was prepared, giving a false but plausible cause of death. This was sent to the family along with an urn of ashes (random ashes, since the victims were cremated en masse). The preparation of thousands of falsified death certificates took up most of the working day of the doctors who operated the centres. During 1940 the centres at Brandenburg, Grafeneck and Hartheim killed nearly 10,000 people each, while another 6,000 were killed at Sonnenstein. In all, about 35,000 people were killed in T4 operations that year. Operations at Brandenburg and Grafeneck were wound up at the end of the year, partly because the areas they served had been cleared and partly because of public opposition. In 1941, however, the centres at Bernburg and Sonnenstein increased their operations, while Hartheim (where Wirth and Franz Stangl were successively commandants) continued as before. As a result, another 35,000 people were killed before August 1941, when the T4 programme was officially shut down by Hitler. Even after that date, however, the centres continued to be used to kill concentration camp inmates: eventually some 20,000 people in this category were killed. Like the Judenrat (“Jewish Council”) leaders during the Holocaust, psychiatrists were able to save some patients during the T4 Program, at least temporarily, but only if they cooperated in sending others to their death. The handicapped killing centres developed gas chambers like those later used at extermination camps. As the extermination camps did later, the handicapped killing centres installed ovens to dispose of dead bodies. The death camps that followed took the technology to a new level. The extermination camps could kill thousands at one time and burn their bodies within hours. This entry was tagged History, Holocaust, World War 2. Bookmark the permalink. The T4 program was not a radicalization of, but a full implementation of the eugenic creed. Read H.H. Laughlin’s “Model Eugenical Law” and you will see that minor social “defects” such as alcoholism and stutterers were on the list of individuals seen as a cancer on the gene pool. (SEE: http://www.HHLaughlin.com ) The inclusion of ethnic minorities to the list of birth defects was also not a radicalization of eugenics, but part of its stated purpose. Ethnic minorities were seen as a cancer on the gene pool by eugenicists long before the Third Reich. From its onset, eugenics saw the offspring of a Anglo white and an ethnic minority as a step backwards evolutionary-speaking. They reffered to this as “Degeneration” and the product was labeled as an “atavism”, which literally means a step back to a more primitive state of evolution. People with birth defects were not seen as genetic abnormalities. They were also seen as “atavisms”. This is part of the reason for the term “mongoloid”, which basically insinuates that the person is a reversion to a more backward people. This article fails to mention Karl Binding and Alfred Hoche, which were Nietzsche’s friends. They were also lawyers. They were the ones responsible for translating Nietzsche’s various observations about “lives unworthy of life” into legal concepts and statutes to be implemented. But thanks for the input, it is much appreciated.